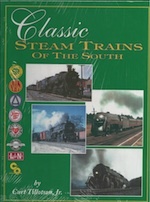 A look back at the steam trains of the southeastern United States with some great photographs of the era 1930-1955, illustrating operations on many of the South's premier railroads including the Norfolk & Western, Southern, Seaboard Air Line, Atlantic Coast Line, Richmond Fredericksburg & Potomac, Clinchfield, Louisville & Nashville, and more. This book is primarily a photographic album showing the roads in the South during the last 2 decades of steam operations. The extended captions provide information about the scenes pictured, the motive power depicted and other background data.